Even though humans are a species that builds and maintains our own shelter (also known as “homes”), we can all appreciate the beauty that the natural outdoors has to offer — and indeed, there are entire industries dedicated to beautifying our own outdoor spaces so that we can reap maximum enjoyment out of them. If you’re a new homeowner or you’ve just run out of ideas for how to make the outdoors feel like a part of your home, then use this list of ideas and implement a couple at a time. You definitely don’t need to tackle all of them, but every little effort you can make toward building a better backyard — or front yard — will make your outside time that much more enjoyable, and you’ll spend more time outside as a result. One of the quickest and cheapest ways to make your home’s outside spaces look immediately nicer is to add some curated plants to the environment. This could mean flowers, always popular in the spring and summertime especially, but it might also mean succulents, shrubs, or other greenery to help spruce up the atmosphere or even hide some unsightly areas or fixtures outside, such as an air conditioner. The internet is always a good first stop when you’re looking for plants to add to your living space, but your local nursery is an equally good option. Make sure you tell them what kind of maintenance you’re willing to do and whether you want an annual (which won’t last into next year) or a perennial plant, then let them guide you toward local plants that will thrive in your climate. There’s nothing like enjoying yourself outside and then suddenly realizing you’re being eaten alive by mosquitoes or another pesky insect intent on making you itch and causing you pain. Depending on where you live, this might be a minimal or a huge problem, but there’s a lot you can do to minimize the chances that you’ll be bugged by the bugs. Zappers, candles, and other insect-mitigation tools and products can keep your outdoor lounging spaces relatively pest-free; if all else fails, make sure you’ve got plenty of bug spray on hand and use it whenever you need it (and offer it to your guests, too). You can’t lounge easily outside if you don’t have comfortable furniture for lounging, and adding a rocking chair or a porch swing to your front porch, or an entire patio furniture set out back, are all popular ways to enhance your outdoor spaces, but you also have options like hammocks, deck chairs, and many other items that make spending time outdoors just that much more comfortable. Outdoor furniture isn’t always the most comfortable by itself, so many outdoor enthusiasts opt to supplement it with pillows and blankets that are made with weather-friendly materials but still soft and soothing enough to be inviting. Some companies make pillows and other accoutrements specifically for certain items of furniture, but you can also do quite a bit with some run-of-the-mill outdoor pillows and blankets that are all-purpose and fit just about anything. When the sun goes down, so does the temperature in most climates, and it’s nice to have a little heat to huddle around while enjoying a meal or a drink. Depending on your setup, you might want to invest in a fire pit or even an outdoor table that’s got a fire feature in the middle — they come in an array of styles these days, to accommodate wood fires, gas fires, or even pellet fires. Find an option that suits your needs and read reviews for the products available before you splurge on something so you’ll be perfectly happy with your fire feature. Most of them can last for years and provide a real spark of something extra to your outdoor living space. Some climates lend themselves to a full water feature outside, while others don’t — but even if you don’t really want a water feature, one way to make your outdoors area virtually maintenance-free is to install automatic watering capabilities so that you don’t have to water your lawn or your plants yourself. Automatic sprinkler systems are one option, but you can also implement an irrigation system for the flowers, shrubs, and other plants that serve as decoration around your house. And those don’t even necessarily have to be all that expensive; there are glass bulbs you can fill with water and stick in the soil that only need to be refilled about once a week and will keep your greenery green. Not every neighborhood or household is the type to support pop-bys, but if yours is and you’re tired of missing people who wanted to say hello or drop something off, put a little message center by your front door. This can be a chalkboard or a dry-erase board — whatever suits your style — but make sure you include the chalk or markers so you can not only leave messages but also receive them from the folks who didn’t catch you at the door. A fresh coat of paint can work wonders for a house, but if you don’t need (or want) to do your whole house, consider painting just the front porch and door area. You’ll be pleasantly surprised by how much it enhances the look of your house, and it’ll make your time spent on the front porch that much more enjoyable when you’re surrounded by fresh color (and no chipping or peeling). Light fixtures are one of those items that we don’t even notice after we’ve lived with them for a while; our eyes just pass right by them. So you might not even notice that your porch light or deck light could use replacing, but now that you’re thinking about it, ask yourself: Would I like this better if it looked like something else? This is a fairly cheap upgrade that you can make on your own and that can make the entire outside area look fresher and more modern (or vintage, depending on your choice). Another reason why some people prefer to spend their leisure hours inside is they’re trying to avoid the sun, either for health reasons or because they simply don’t want it shining in their eyes while they’re trying to read. An easy way to encourage those homebodies to step outside is to provide them with some shade. Patio umbrellas are one easy and cheaper way to accomplish this, but there are also companies that can provide a retractable shade for your entire back deck or patio, giving you the option to welcome the sun when it’s cooler outside and shield it when it’s bright and hot as, well, itself. Do you have a place to store your lawn and garden tools, or even the games and toys you and your family like to break out when it’s time to go outside? A cluttered or messy outside area can be a deterrent to spending quality time together outside, so make sure you’re considering storage when you’re thinking about upgrades you could make to your outdoor space. This might mean adding a shed, investing in some benches with lift-up storage space underneath, or simply cleaning out your garage to make some space for the things you don’t want out in the open — then making a point to stash them when you’re finished. As humans, food and drink will likely always be central to our idea of a good time, and one way you can facilitate more time spent outside is to add or update an outdoor kitchen or even an outdoor bar so that you don’t have to step inside at all to feed your soul (or your stomach). A lower-level outdoor kitchen might simply involve a table and chairs for dining, plus a grill for cooking, but some culinary aficionados might want to go all-out with a full stove and kitchen set for outside, complete with flatware and the plates and bowls you’ll need for serving. Bars can be wet (include a faucet and sink) or dry, but giving yourself a space to store your drinks and some ice to keep them cold will make it that much easier to throw impromptu parties al fresco. Sometimes your outside upgrades can also have benefits for what you’re doing indoors, like cooking. Using fresh herbs instead of dried versions can perk up any dish, and planting an herb garden outside will make all your meals taste better. You can go all-out and set aside a section of a garden for herbs, but an assortment of pots on your porch with basil, mint, and other common herbs is just as effective and requires less maintenance, so pick an option that works best with your lifestyle and run with it. 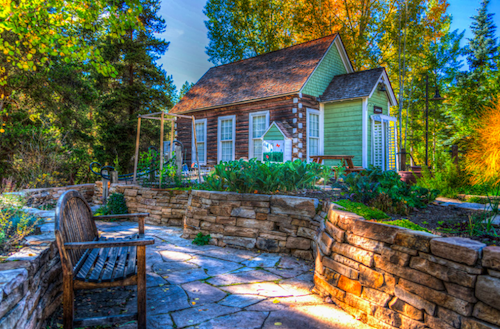 Gardening isn’t for everyone, but if it’s for you, adding garden beds to your lawn and using them to plant everything from flowers to vegetables to the aforementioned herbs can make your whole outdoor space sing. Your local hardware or home maintenance store can help get you started here, and talking to the experts at your local nursery is also helpful in terms of determining what you want to plant and how much space you’ll need. Garden beds typically need at least weekly care (like weeding) to stay in pristine condition, so they aren’t maintenance-free, but when you’re enjoying the fresh flowers or baby tomatoes you just pulled off a plant, it’ll all seem worth the work. Climbing plants like roses and ivy can be woven into trellises, incorporated onto deck or balcony spaces, and any number of other spaces to help enhance the look of your house and provide a pop of color and vibrancy. They don’t do well in every climate (although you might be surprised by how prevalent wild roses are when you start to do some research), so talk to your local nursery experts about what to expect, but if you’ve always enjoyed the idea of climbing roses festooning your fence, do yourself a favor and research whether it’s a possibility. Bird-watching is a hobby for a reason — plenty of people get a lot of peace and satisfaction from watching their avian friends flit around a yard, identifying them, and taking care of them. You can make your outdoor space a bird haven by adding a birdbath for them to wash and a feeder or two for them to take sustenance. Depending on where you live, you might be able to attract hummingbirds or songbirds or other types of birds; the internet or a library book could give you a start figuring out what the birds like and how to best attract them in terms of feeders and food. The adage “good fences make good neighbors” might or might not be applicable to your own situation, but even if you don’t want to keep your neighbors out, a sweet little picket fence can delineate your yard and make your whole house look just a little bit nicer. If you do want privacy, a taller fence can help provide it — and who knows, maybe your neighbors will appreciate it, themselves. Whether you want fresh fruit in the fall or just a little bit more shade, sometimes trees are the answer to most (if not all) of your problems. Your climate will dictate what kind of trees will work best for your yard, and your home’s structure and other factors will dictate the best place to plant, so a consultation with the local nursery and a trustworthy landscaper is probably in order — and be aware that if you’re not planning on staying in your home long-term, you may not be able to reap the benefits of the trees you plant. But they can make your home look more attractive to future buyers, so whether you do want to stay for several years or you’re simply thinking ahead to the next owners, trees can be a wonderful investment. Fairy lights in the garden or solar lights lining the driveway can give your house a dreamy, magical look after hours. Adding a few lights here and there might make it more tempting for enjoying outside when the sun has gone down, so if you feel like it looks a little too dark and gloomy for your tastes, there’s an easy fix for that problem. What you do to upgrade your outdoor spaces really depends on your personal preferences and how your household uses those spaces today — and how they’d like to use them moving forward. With a little bit of planning and some time and money investment, you can have an outdoor area that you never want to leave.